Rose Blossom Legacies: Happy Mother's Day! I am so grateful to have this day to celebrate my mother. She is a wonderful woman filled with strength, courage, determination, and lots of love for all of her children and grandchildren. I used Happy Times to make her gift this year. It was the perfect paper for her, and I simply covered a frame. She lives in apartment now, but in the home we grew up, she loved her flower beds! And out of all the Moms in the world, I am really glad she is mine! Sounds like we both have wonderful Mother's. Love your Frame,Great Job! Glad I stopped by. 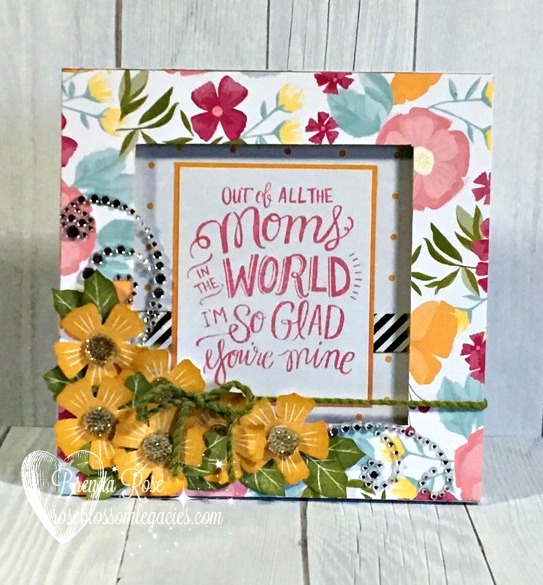 What a beautiful gift for your Mother! Love it Brenda!